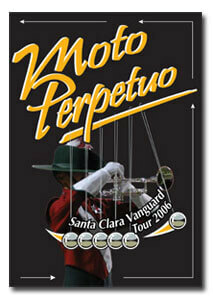 Santa Clara Vanguard product release: Santa Clara Vanguard's 2006 tour DVD is now available and ready to ship. The DVD chronicles the corps' 2006 season including performance footage of the group's production "Moto Perpetuo," behind-the-scenes features, encore performances, Individual & Ensemble performances, and more. Learn more about the product, view a video trailer and purchase the DVD on www.scvanguard.org.